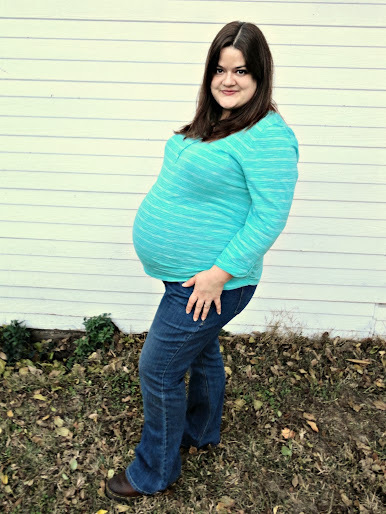 You’re considered full term at 36 weeks, and I’m both facing challenges (like relearning how to walk and even roll over in bed), and relishing the advantages (Joshua’s fighting chances if he comes early are quite good now). 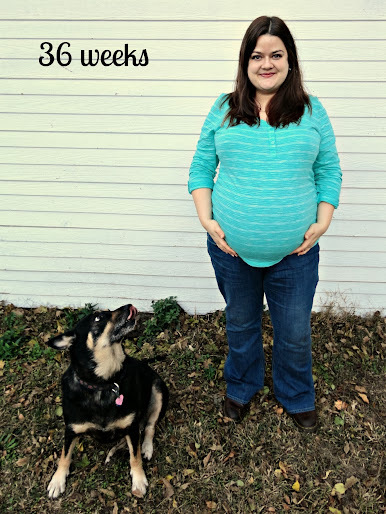 I’m a mixture of emotions over the upcoming birth, and most people want to know if I’m excited. I may be strange, but I’m not really excited. Sure, I’m looking forward to meeting this boy, and being a real Mom with a baby outside my womb, but I’m more scared than excited. Scared of delivering him, and scared to have an actual baby that cries and relies on me to sustain his life. Scared of how different our life will be after I’ve had so many years to get used to it the way it is. I’ve been “just” a wife for so long that I’m scared of being a Mom. It’s probably telling of something about me and my past, but I can already feel the judgement from other parents on my own parenting skills and I know that every time I’m with him around other parents, I’m going to be hyper aware of their critical eyes upon me and I’m going to feel like a failure. In any case, when he comes isn’t up to me. It’s up to my doctor, and ultimately up to God. Starting tomorrow, I’ll be getting biophysical profiles done on Joshua (like a sonogram but faster) every week to make sure he isn’t getting too big. If he does, hello inducement! Because of all the things I want to get done and not wanting an epidural if I can help it, I really do not want to be induced (it makes the pain worse, or so I hear), but of course I’ll do what’s best for both of us. It wouldn’t be good for either of us to try to deliver him at 13 pounds. Pretty sure induced labor without an epidural would be better than a broken hip (and definitely better than a broken baby!). And even though Lacey (my youngest sister) gave birth to an almost ten pound baby without any trouble, I’m not going to fight my doctor if he thinks it’s what’s best. There would be some nice things about delivering early. I really am looking forward to being able to lay on my back again. I’m really looking forward to the first time I can do it, when I have my new baby in my arms and we can just lay back together in the hospital bed. That will be bliss. Also, I’d love to be able to walk pain-free, and to trade in the blobs at the end of my legs for real ankles and feet again. My cankles are out of control! You’ve heard of puffer fish? Well these are puffer feet. As you can tell, I’ve given up trying to give myself another pedicure, though my toenail polish is falling off slowly but surely. And the blue dot between my feet is a piece of confetti that made its way all the way from my Abilene baby shower to our home a week later. I vacuumed and the dot showed up out of nowhere, probably because we’ve been putting all our shower gifts away. It must have made it’s way here in a bag. Speaking of baby showers, I just had my final one and I’m going to post all three of them (starting off with a bonus shower to make four, yes four!) this week. Come back tomorrow to hear about Joan’s Aunt Shower. It’s a really neat idea you might want to do for a friend (or hint to your own friends to throw you one) in the future! I think the last thing you should be concerned about is what other people think of your parenting skills. You’re Joshua’s mother and you’ll do everything just right for him. My dear mommy-to-be, yes it can be scary thinking about all the responsibility of having a child and the many changes there will be in your life. I can tell you, though, that none of us were born a parent; we all had to grow and learn with our children. And that is a GOOD thing. We don’t learn to parent in a vacuum; we learn with real children in real situations. I became a single parent when my children were very young and I was terrified of not being perfect and of other peoples’ criticism, like you. But I decided that instead of worrying about what I was doing “wrong” or what other people thought of my parenting, I would watch other parents and when they did things that I could see were helpful and effective, I incorporated those things into my parenting. I tried to stay focused on loving and parenting as God loves and parents us. I asked for His help daily…. and sometimes moment by moment! I still ask for His help and guidance today…. and my kids are 40 and 42 years old with kids of their own. We don’t have to be perfect; our kids need a “good enough” parent who stays close to God. I finally decided that if I did well about 80 to occasionally 90% of the time, my kids would be fine. And they are. And your baby will be, too. Bless you and enjoy that little bundle of joy! You rock! You look beautiful, and it’s going to be easier than you think once he’s here. Don’t wig yourself out worrying about other moms judging you and all that–I was also expecting some of that and really don’t have any horror stories (yet =). You’re going to adjust just fine, and not just fine, but joyfully. Well those are all valid fears and emotions at this phase. I remember having some of the same worries. I think it’s wonderful that you are voicing those worries and not keeping it all bottled up. You will do just fine as a parent and you aren’t going it alone – you have Boot Camp Dad by your side! ah the home stretch. Just keep telling yourself, millions of woman have done this before me and will do this after me, some not as fit to be a mother as I am…and its true. You will be a fantastic mother. Word of advice though, its fine to have a birth plan, but be flexible. Bottom line is healthy mom and baby…we don’t always get to choose or control the path at which our kids get here and you shouldn’t feel any lesser if it doesn’t go as you planned in your mind. :) BTW…both of my boys were pushing 10#. So I feel your third trimester pain! Love the photos and this heartfelt post. Thanks for sharing with us. You are going to be such a natural!! And you won’t hardly remember not having your precious bundle in your arms. It’ll all come to you when the time comes, and it sounds like you have plenty of helpers and moms who will be willing to offer help along the way. You are looking SOO good! All except for those ankles…what a treat it will be to have them back to normal again huh? Take good care Dear. Sure do appreciate the updates. Such an exciting time for you! Totally understandable about hoping for a Thanksgiving before the baby. But just think of how joyous Christmas will be for your family this year!! you’ll be a great mama!! It’s not uncommon to worry, before or after. Just be the best Mom you can be and your son will be thankful. God chose you to be Joshua’s Mommy and He doesn’t make mistakes. Forget about what other people think. You will be the best Mom Joshua could ever want. I just thought I would take a moment (while you still have time to read the comments) to wish you the very best with your new baby. I gave birth to 3 children and I was scared each time, so that is not unusual! However, once you have your baby in your arms, you will fall in love and experience a true blessing!!! Congratulations to you and your husband!! You will be a great Momma! I was young and dumb when I had Hannah – way before What to Expect books, internet, etc. I went to the doctor once a month, tried to eat right, and she popped out just fine. I think your motherly instincts will kick in when he’s born! You will rock as a mom. I have no doubt. None whatsoever!!! You won’t be a perfect mom, sometimes you may even be a “bad” mom, there will always be things that you wish you would have handled differently, could have done better. But here’s a secret…it doesn’t matter! Loving your child and doing the best you can and supporting them and being there for them…those are the memories that get remembered, that’s what will shape your child and your relationship with them. It’s okay to be a ‘bad’ mom sometimes because the good will out way the bad. You will do a fabulous job! You are no different than any other new mom to be Veronica. You will do just fine. God will give you the wisdom and grace to handle each and every situation as it comes, not before though. Stay on your knees, He will get you through it all, from labor through bringing that precious baby home. You look great!